WASHINGTON — President Trump said on Wednesday that the charges against Judge Brett M. Kavanaugh, his Supreme Court nominee, were “very unfair” but added that he wanted to hear from the woman who has accused the judge of sexually assaulting her when they were both teenagers. 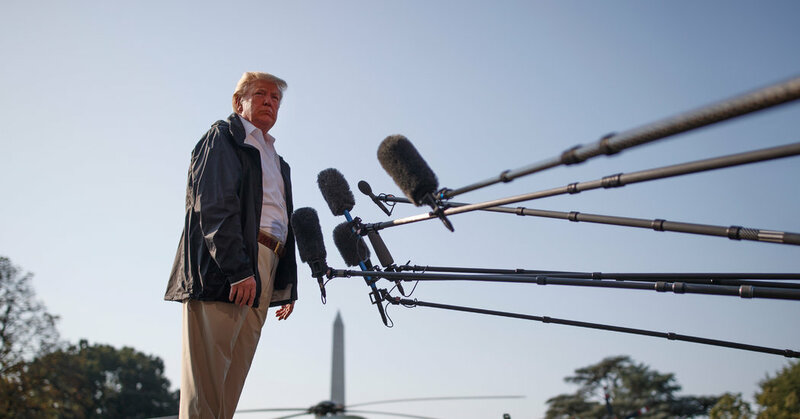 Speaking with reporters before leaving the White House to visit hurricane-ravaged North Carolina, the president again refrained from directly questioning the credibility of Judge Kavanaugh’s accuser, a tactic he has used in other instances of sexual misconduct charges, including those lodged against him. But he expressed sympathy for his nominee. As for Christine Blasey Ford, the university professor from Northern California who has alleged that Judge Kavanaugh pinned her to a bed, groped her and tried to remove her clothing at a high school party, the president said he hoped she would testify. Lawyers for Dr. Blasey, a research psychologist, on Tuesday evening all but ruled out her appearing at a Senate Judiciary Committee hearing scheduled for Monday to hear her allegations. Dr. Blasey’s lawyers said that she wanted to cooperate with the committee but that it would be premature for her to testify and that the F.B.I. should investigate first. Her position echoed that of Senate Democrats who complained that Republicans were trying to rush an examination of her charges so as to expeditiously confirm Judge Kavanaugh, but Dr. Blasey’s refusal to commit to testifying seemed to solidify the Republican caucus behind moving ahead with a vote. Even wavering Republicans who insisted on hearing her before deciding on confirmation said she should show up on Monday to testify.